A red, tomato-based condiment typically served with grilled or fried food, such as hamburgers, hot dogs, french fries or eggs. The main ingredients in modern ketchup are tomato concentrate, sweetener (generally corn syrup or sugar), vinegar, salt, spices and garlic powder. A thick red tomato sauce with a very smooth texture. Not extremely fluid, yet pourable. Flavors: Uniquely plays on all five tastes: sweet, bitter, sour, spicy, umami. Food complements: Generally used as a topping for burgers, French fries, And hot dogs. Beverage complements: Beer, Tea, Soft drinks. Buying: Ketchup is widely sold and used in most modernized countries. It is packaged in small tear-open packets, glass bottles, and squeezable plastic botles. Heinz is the lead brand name for the popular condiment, followed by Hunt's. Procuring: In the past, ketchup was produced from fresh tomatoes after harvesting. Vacuum evaporation made it possible to turn tomatoes into a very thick tomato paste that is easy to store at room temperature. This enables a factory to produce ketchup throughout the year. Ketchup is often used with french fries, hot dogs, hamburgers, and various cooked meats and as a base for sauces. In countries such as Australia, New Zealand and in South Africa the term 'tomato sauce' is used instead of the British and American usage of the word ketchup. 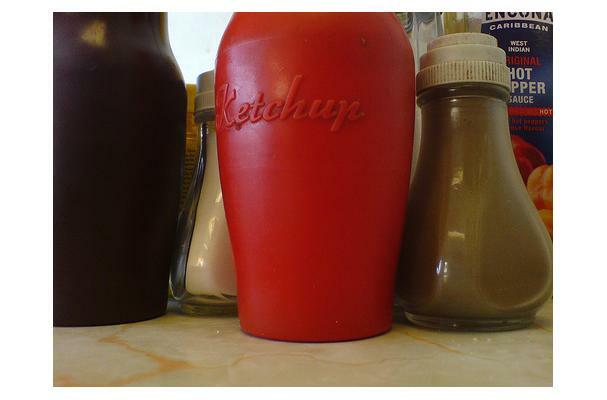 Ketchup is also known as tomato ketchup, red sauce, Tommy sauce, Tommy K, or dead horse in Australian rhyming slang. Ketchup can be stored at room temperature because of the preservatives added to it, but refrigeration is also acceptable and will not affect its integrity. In 1981, Congress ordered the United States Department of Agriculture to issue new standards for federally financed school lunch programs, which would enable schools to economize; one of the USDA's proposals was to classify ketchup as a vegetable. The suggestion was widely ridiculed and the proposal was dropped. History: Although today's ketchup is tomato based, it did not appear until about a century after other types. By 1801, a recipe for tomato ketchup was created by Sandy Addison and was later printed in an American cookbook, the Sugar House Book. James Mease published another recipe in 1812. In 1824, a ketchup recipe using tomatoes appeared in The Virginia Housewife (an influential 19th-century cookbook written by Mary Randolph, Thomas Jefferson's cousin). As the century progressed, tomato ketchup began its ascent in popularity in the United States, influenced by the American enthusiasm for tomatoes. Tomato ketchup was sold locally by farmers. A man named Jonas Yerks (or Yerkes) is believed to have been the first man to make tomato ketchup a national phenomenon. By 1837, he had produced and distributed the condiment nationally. Shortly thereafter, other companies followed suit. F. & J. Heinz launched their tomato ketchup in 1876. Heinz tomato ketchup was advertised: "Blessed relief for Mother and the other women in the household!"